As the university expands, there has been a demand for more space, so, last year, Michigan Tech purchased the old UPPCO building. The MTEC SmartZone received a $3.02 million federal Economic Development grant for renovations to the building. 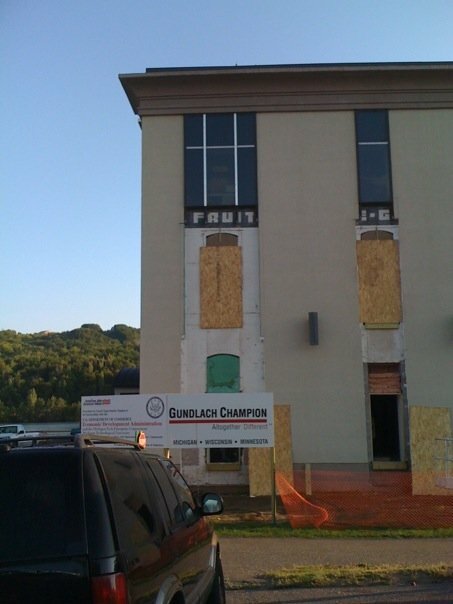 Gundlach Champion has been constructing the project. Now, the former UPPCO building, located on the Houghton Waterfront, has a new name – the Lakeshore Center. “The project is in process and we’re hoping to be fairly well complete for people to move in late this fall, about Nov. 1,” [MTU Facilities head John] Rovano said. 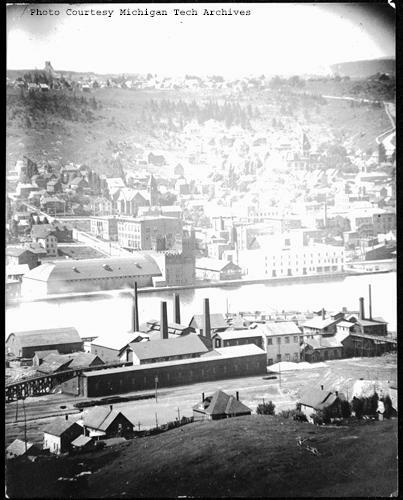 What the story fails to mention, however, is the long history of this building on Houghton’s waterfront. Driving by the building this week, the renovations have begun to expose some clues to the building’s origins. One can clearly read the word “fruit” — revealing the building’s former use as a waterfront warehouse. 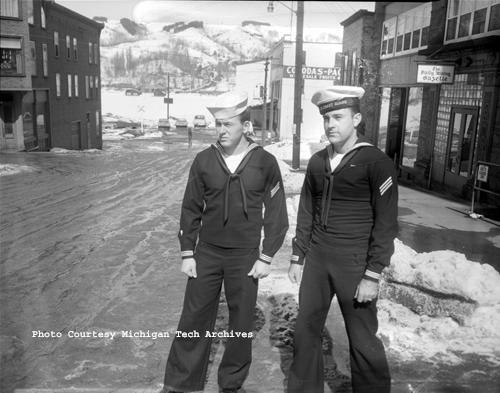 Sources in the Michigan Tech Archives vertical files indicate the building was constructed in the early 1900s as a warehouse storage facility for the Peninsula Wholesale Grocery. A Sanborn fire insurance map for 1908 shows the original building covering only a single waterfront city lot; by 1917 it had enlarged to cover the 4 city lots it currently occupies. 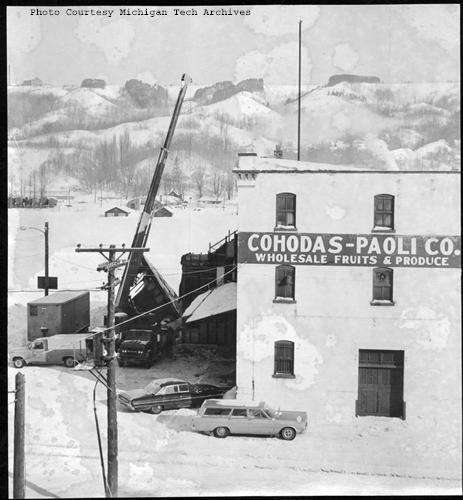 Although the exact date is unclear, the building changed owners and was used for many decades as storage warehouse for the Cohodas-Paoli Company which specialized in the wholesale market for fruits and vegetables. In 1991, the building was renovated by the Upper Peninsula Power Company for use as its office headquarters. Michigan Tech finalized its purchase of the building from UPPCO in February 2008. 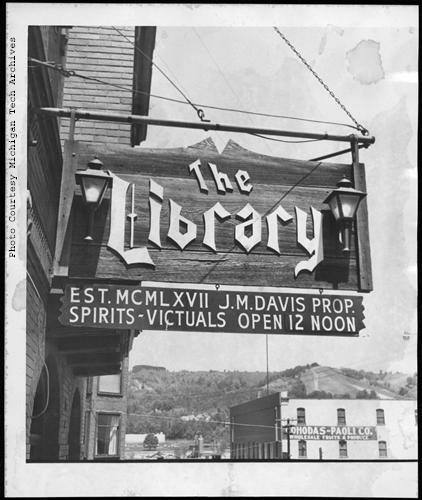 A visit to the Keweenaw Digital Archives (http://digarch.lib.mtu.edu/) finds many interesting historical photographs of the building. Some of the best photos, however, aren’t just about the warehouse building, but are those that catch it as a background element. It’s great that Michigan Tech is giving this building new life as the Lakeshore Center — and also lots of fun to celebrate its 100+ year history in photographs as one of the many landmarks on Houghton’s waterfront.